With Hua Hin being an extremely popular tourist destination in Thailand, the Hua Hin Fishing Lodge is an excellent place to stay and fish at during your time in the country. One of the most appealing aspects about the Lodge is that it serves up plenty of chances to catch the big fish in Thailand. 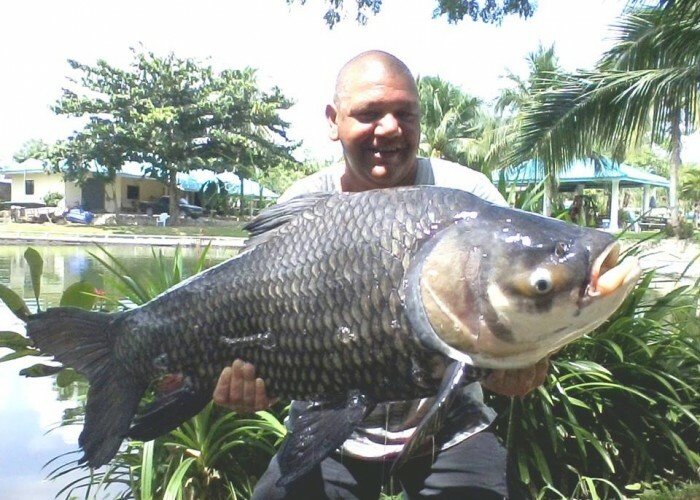 There is plenty of Arapaima, Giant Mekong Catfish and Amazon Redtail Catfish to look out for at Hua Hin Fishing Lodge. This is a friendly fishing resort which goes all out to make your day or stay enjoyable so whether you are looking for a relaxing fishing break or you fancy going after your personal best, this is a fantastic choice of fishing resort. Located just 10km from the town centre of Hua Hin and less than 3 hours from Bangkok, this is an ideal destination. With two ponds and 44 different species of fish on hand at the Hua Hin fishing Lodge, there is something for every level of angler. The lodge provides a baitman/guide for all anglers and all of the equipment and bait that you will need. The Lodge is also able to provide you with food and drink so you can focus on fishing your entire day without having to worry about coming back and forth. The Hua Hin Fishing Lodge ensures that everything away from the fishing is perfect, which provides you with the chance to relax and solely focus on the fishing when you can. Whether you are looking to beat your personal best records or you just want to while away a great deal of time fishing, this is a fishery that provides something for everyone. While the monster fish such as the Arapaima, the Giant Mekong Catfish and the Amazon Redtail grab most of the attention, there are plenty of excellent species to look out for at the Hua Hin Fishing Lodge. You will find Alligator Gar up to 70lbs, Pacu up to 25lbs and Giant Siamese Carp up to 70lbs. There is a broad range of species to look out for and if you have a particular fish in mind, ask a guide and you will receive assistance in hunting this style of fish down. There are showers around the lakes to help you stay cool or to get clean after you have been in the water to have a picture taken with your big catch. This is a simple feature, but it is one that can really improve your day if you feel clammy or dirty. There is a kid’s playground on site so if you are travelling with your family, there will be something to keep the kids happy and entertained while you enjoy a good fishing session. There is also a highly recommended restaurant on site, allowing you to chat about your fishing exploits over a range of Thai and Western dishes. There is also a pool room if you are looking to relax and unwind after a good day’s fishing. Package includes Rod Hire x 2, Tackle, Adequate allowance of Bait, Fishing Guide (Barry Gregory), Meal (Breakfast or Lunch) and local transfers £85 per angler per day. The Ciacada Market, which operates at night, is one of the best places to visit in Hua Hin and you will find a stunning array of food, drink and arts and crafts products on offer. You should visit the Hua Hin Railway Station if you are looking to get out of town, you should check it out for its stunning wooden structure and affordable yet highly enjoyable restaurant. If you are travelling with the family, the Black Mountain Water Park is an excellent place to visit. There is a wide range of slides and flumes to enjoy, as well as plenty of pools, and the queues never get too long.